NANDA SOOBBEN internationally acclaimed South African cartoonist has been plying his trade for the past twenty five years. His socio-political statements, cartoons and illustrations have been printed in newspapers such as The Post Newspaper, The Independent on Saturday, The Daily News and the Sunday Tribune. His cartoons are also syndicated to major international newspapers. 2009: Nanda Soobben won Vodacom Journalist of the Year in the KZN Cartoon Category with his cartoon on page 14. His tertiary education was completed at the ML Sultan Technical College (DIT) where he graduated with a Diploma in Graphic Design. He then went on to study at the prestigious Parsons School of Design (Animation) in New York as well as serving an internship at the San Francisco School of Visual Art. Since 1980 there have been thirteen exhibitions of Nanda Soobben’s work in North and South America, India and South Africa. A significant exhibition was held in the 1980’s during the apartheid regime, it was called “Cato Manor – People Were Living There!” It was about forced removals and the group areas act. Soobben has also given a talk at the World Affairs council in San Francisco titled, “My life as a Black Political Cartoonist in Apartheid South Africa”. ABC Television featured the mural painted by Nanda Soobben for the ECO 92′ summit in the Bay of Rio, as well as the peace mural in New York. Nanda Soobben has received many prestigious awards. But it was the Tom Thumb art competition, which he won when he was nine years old that sparked his desire to explore his creative talent. In 1987 he was made an honorary life member of the Brazilian Academy of Fine Art. In 1999 he received the Nataraja Award from the Arupta Khazaghum. As creative director of Coffee Machine Animation Studios, Nanda Soobben is currently working on a number of animation projects. An animation project called “Taxi” featuring stories and social messages set in a typical South African taxi is currently being pitched to television broadcasters. Soobben is also commissioned by the Department of Arts and Culture to create an animated movie of his historical editorial cartoons. 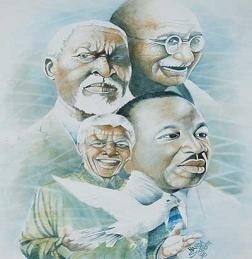 When Durban film producer Anant Singh wanted to give Nelson Mandela a special gift for his 77th birthday, he approached Nanda Soobben for his cartoons. Soobben handed over a number of cartoons which depicted some of the more controversial times in Nelson Mandela’s life. At the end of 2004 Soobben launched his long awaited book of cartoons called “Witness to a Decade”. The book has become a sought after record of South Africa’s first ten years of democracy. The book was also launched in Mumbhai, India in January 2005 at a conference of Indian Diaspora. Much of his work is included in Public and Corporate Collections such as the Smithsonian Museum in Washington as well as the Killie Campbell Collection of UKZN. Presently Nanda Soobben is the founder and creative director the Centre for Fine Art, Animation and Design. Several of Soobben’s cartoons are part of the “Artists in Exile Exhibition”. The Centre for Fine Art Animation and Design (CFAD) was founded in 1994 by Nanda Soobben, and through this tertairy institution many previously disadvantaged individuals have been equipped with skills to thrive in a high technology art and design work environment. Nanda Soobben’s vision and impact on the art, design and animation fields in South Africa can only be judged by the great achievements of the many individuals who have come into contact him.